The Alfa Romeo 182 is a Formula One car that was used by the Alfa Romeo team during the 1982 Formula One season. The car made its debut at the 1982 Brazilian Grand Prix. In the third race of the season at Long Beach, Andrea de Cesaris achieved pole position at an average speed of 141.331 km/h (87.819 mph). The best race was at Monaco, where de Cesaris placed 3rd. Alfa Romeo used three different models throughout 1982: the 179D (2 entries), the 182 (28 entries) and the 182B (2 entries); all with Alfa Romeo 3.0 L V12 engines. The Alfa Romeo V12 produced about 540 hp at 12000 rpm. 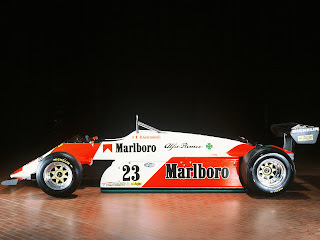 The 182B variant was tested for the first time at the 1982 Belgian Grand Prix at Zolder; this version was 12 centimetres (4.7 in) narrower and had a new exhaust and side skirts. At the Italian Grand Prix, a turbo variant of this car, designated 182T, which carried a V8 turbo engine was tested by Andrea de Cesaris. It was not used in the race though. This version was derived from the 182D version. The 182T was converted to one of five 183Ts later next year. Last updated on 31 December 2013 at 23:52.